We shared a beau­ti­fully illus­trated trip around the Scottish Islands includ­ing Mull, Islay and the Northernmost tip of the United Kingdom in the Shetland Isles, where the Muckle Flugga light­house resides. 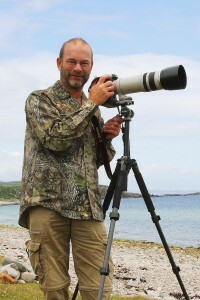 Nature was the focus of Steve’s talk and we were treated to some stun­ning pic­tures of Eagles, Terns, Gannets and Otters. Mixed in with these were some mag­ni­fi­cent shots of the most won­der­ful scenery that Scotland can offer. The sunset view over the har­bour from Seal cot­tage on Islay, made me want to jump in the car and get there!